Ability to undo the sending of email messages or recall sent email messages is normally feature exclusive to enterprise email solutions such as Microsoft Exchange and Novell GroupWise. Recall an email message asks the mail server to attempt to remove and delete the sent email message from the recipients’ mailboxes or Inboxes, as if the email was never sent. There are several reasons why you may want to undo a send email action or recall an email. For example, you may forgot to attach a file, accidentally clicked on Send button before finished composing the message, included inappropriate information in the message, sent the email to wrong recipients, to correct a typo, or simply just want to revise what was originally sent. 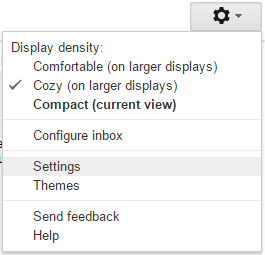 Gmail has the capability to undo send action. In fact, the “Undo Send” has been available for several years since launching in Gmail Labs six years ago. It’s now permanent feature of Gmail and Google Apps, and is available for use on web-based Gmail, Inbox by Gmail app, and Gmail app in Android and iOS. However, there are differences between Gmail’s “Undo Send” and typical “recall email” feature. Mail server supporting recalling of emails will send email right away after sending. Recall email function normally always available for all sent email messages as long as the emails haven’t been read yet (though most mail servers will replace the recalled email with a message that email has been recalled by sender), while an additional message may be added for read email that sender is attempting to recall the email. Another important limitation is email messages must resided on the same mail server of same organization. You simply can’t recall email messages sent to email addresses outside your organization. For Gmail’s “Undo Send” to work, Gmail is actually delaying the sending the message for a few seconds (or the time that you set for Undo Send command to available). As such, it works for all emails you sent to anybody in the world. The trade offs are the delay of email sending, and you cannot undo a send after the send cancellation period. So if you don’t cancel a send within the set time frame, you lost the ability to stop the email from sending. Login to Gmail on the web. Click or tap on Gear icon to open the menu, and select Settings. In “Undo Send” section, tick the Enable Undo Send function. Select the send cancellation period (i.e. duration avaiable for you to press the “Undo Send” button to stop an email) that you prefer from the drop down box. The choices available are 5 seconds, 10 seconds, 20 seconds and 30 seconds. Click or tap Save button when done. That’s it. After you sent an email, an Undo option will be shown at the top of the Inbox, which will automatically disappear after the send cancellation period ended. If you undo the sent message, the email won’t be sent and Gmail gives you the option to delete or edit it instead.